The announcement last month that Slowdive have reunited was reverb-soaked elysium to the ears of shoegazers around the world. The cult British group, who went their separate ways 20 years ago, are set to play a string of shows this summer, including a set at Primavera and a show at London’s Village Underground. Here they present an exclusive heady mixtape that brings together some of their favourite shoegaze-tinged tracks from the past two decades. 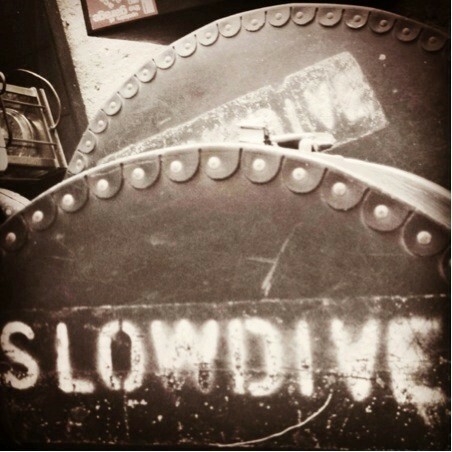 As you stream the mix, read Slowdive's Simon Scott explaining their selections below. Simon Scott: "The s l o w d i v e (s l o w d a z e) mix has been compiled from some of our favourite tracks, in particular from groups less famous than The Cure or The Smiths, ranging in musical styles from post-rock to ambient, classical to 'shoegaze'. In 1994 Slowdive were a deeply unfashionable group, especially in the UK, and struggled to play gigs to more than to a few hundred people. The press were becoming increasingly infatuated by grunge and we were the token guitar band to make disparaging remarks about. Shoegaze was a much berated genre. Each album released was received with poor reviews and one by one each shoegaze band was dropped to make way for Britpop. Since we broke up shoegaze began to globally snowball as an influence on new artists, and today it is crossing over new musical boundaries into genres including metal and hip hop. Therefore we've included a few bands, not naming any names, who have gone on to form bands after hearing shoegaze music or seeing Slowdive play live back in the early 1990s. Not all tracks are shoegaze of course; Slint wrote and released their classic Spiderland album before we broke up, and David Darling is a classical cellist. It doesn't matter, and musical boundaries are there to be broken anyway, as these different styles and individual tracks flow well together and create a vibe that feels like shoegaze tinged with each track worthy to be included whatever genre it derives from." Pluramon (with Julee Cruise) – "Have You Seen Jill?"